Here is the cord clip that was supposed to keep the power cord safe. My power cord is now mechanically secured (no double-sided tape) well clear of the saw blade, and checked for all heights and angles of the blade. Just a thought for owners of a similar model . . . When was the last time any of us even thought to give the interior of our tablesaw a safety inspection? Have a safe day in the shop. Good thing you found this John. I have to wonder at manufacturers who do things like this. It is such an obviously bad idea. Fathers know best…. Great tip about spinning the blade. Thanks for the heads-up on this one, John! Glad you listened to your Dad!! As ugly as that is, if there’s good electrical ground the breaker will pop. 1.) That’s why it’s so important to have proper electrical ground. Without it there’s a chance for electric shock/electrocution when single point failures such as this occur. 2.) GFI outlets offer even more safety for this type of fault. P89DC – I fully agree with your comments, although there is the slim possibility that the blade could cut the ground conductor first. 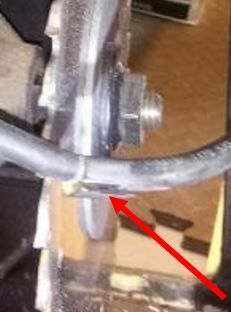 The grounding point on this saw is right at the motor housing, not at the first point of attachment to the frame. So, if the ground conductor is severed first, there is the remote possibility of the unit becoming live without the breaker being tripped. I was trained to establish a solid ground right at the first entry point of the power into a piece of equipment, rather than routing the cabling past moving parts and then grounding. 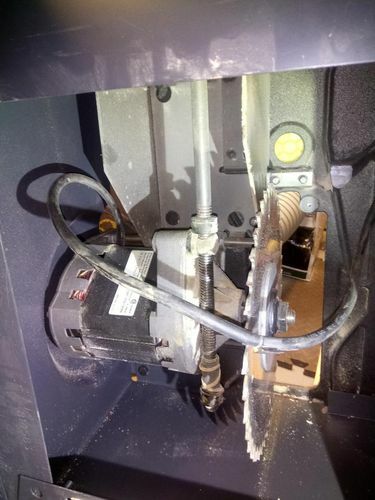 To me, the method of wiring this saw appears to have been a “cost saving” decision, but my main point in posting this was to suggest that safety inspections are well worth doing. Lucky you found the problem Druid. Just goes to show how important an ELCB or circuit breaker can be to shut off the power in an instant. Who would have guessed the cord was there. Good practice to follow, John! It could have been and exciting or shocking experience!! Wow. Glad you caught that! Cord on mine is hanging out the back around to the switch. Asked the previous owner, and apparently the motor was rebuilt, and they were wise enough to not run the cord back up inside! PCDub – Interesting followup on your saw. Sounds like whoever did the rebuild on yours had the same thoughts as I did on the original cable routing.